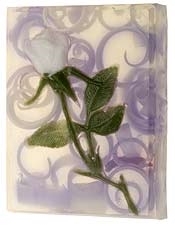 One of our most beautiful designs, a single white rose, hovers over a bed of purple and white curls that float gently in the clear base. Makes a wonderful gift. The fragrance is comparable to Victoria's Secret's Love Spell.